No, such a thing as a free post-frame building foundation engineering calculator does not exist. However there always seems to be someone out there who is in search of “engineering for free”. Do you have a link to a pole foundation engineering calculator? There is no such thing as a “pole foundation engineering calculator” therefore, there is also no link to one. The design of post frame (pole) building foundations is one which is best left in the hands of RDPs (Registered Design Professionals – architects or engineers). When provided with all the pertinent information about your proposed building, they can design not only a structurally sound column embedment, but also your entire structure (which I whole heartedly recommend). Will the building have adequate sheathing (which could be roll formed steel roofing and siding) to transfer wind loads from roof to ground through endwalls? And will the sheathing be adequately fastened to underlying frame to take advantage of sheathing stiffness? If yes, diaphragm design can be utilized in your building design. The difference in forces carried by sidewall columns with and without an adequate diaphragm is a factor of 4! If diaphragm design cannot be utilized, expect significantly larger columns, deeper holes and more concrete around columns. What type of soil is at building site? Strength and stiffness of your soil will impact both depth and diameter of holes. How are you measuring your 14′? It should be from bottom of pressure preservative treated splash plank, to underside of roofing at sidewalls. It does make a difference. Does your building have overhangs? What is the roof slope? What is wind exposure at your site? The difference in force against columns between Exposure B and Exposure C is roughly 20%. 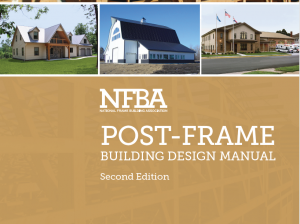 In the event you are not interested in procuring services of a RDP, the NFBA (National Frame Building Association) has available a Post-Frame Design Manual and you could attempt to do calculations yourself. For more information please see: https://www.hansenpolebuildings.com/2015/03/post-frame-building-3/. Of course you could always invest in a fully engineered post frame building kit package. Besides engineer sealed blueprints and calculations, you would also get materials delivered to your site and a multi-hundred page Construction Manual to guide you through to a successful completion. 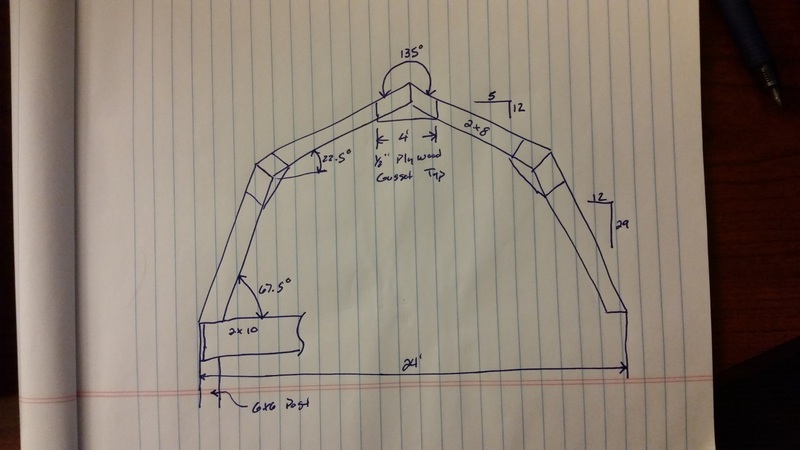 This entry was posted in Pole Barn Questions, Pole Barn Design, Constructing a Pole Building, Pole Barn Planning, Pole Barn Structure, Trusses, Pole Barn holes and tagged wind exposure, RDP, roof slope, NFBA, overhangs, post frame building kit package, sheathing, building site soil on February 22, 2019 by admin. Gambrel style rooflines are often enticing, they offer the feeling (however not the reality) of getting added space for free. Building your own gambrel barn trusses might appear on the surface like a way to make this even a greater savings. Mistake number one is even considering building your own trusses, on site, unless you are constructing them from drawings designed and sealed by a Registered Design Professional (RDP – licensed architect or engineer). Chances are way too good (100% guaranteed) you are dooming your building (and possibly its occupants) to failure. In all seriousness, prefabricated steel connector plated wood trusses are the only way to go – you will save money in the long run and you will be able to sleep soundly at night. Your second mistake is in trying to be your own building engineer. If it was my own building (depending upon the design wind and snow loads), I would probably be using a single truss on each endwall and double (two ply) trusses every ten feet, bearing directly upon the columns. In my humble opinion this will give you the safest end resultant as the trusses can be notched into the columns and not possibly slide down the columns (or have a questionable connection to a header or truss carrier). You can then utilize 2×6 (or 2×8 depending upon loads) roof purlins on edge to support the roofing. Your idea of using 2×4 (I am guessing flat over the tops of the trusses) every two feet and spanning four feet will not work unless you have the availability of lumber graded higher than the Standard and Construction material from your local lumber yard. To avoid making crucial mistakes, which could waste your hard earned money, I would recommend you invest in a fully engineered post frame building kit package. This entry was posted in Pole Barn Questions, Pole Barn Design, Trusses, Gambrel and tagged trusses, post frame building, registered design professional, Registered Professional Engineer, post frame building kit package on May 25, 2018 by admin. Animal shelters have many challenges facing them in their quest to unite abandoned animals with good homes. Battling people’s preconceived notions about rescue pets, public ignorance over curbing animal overpopulation, lack of centralized funding for these non-profit shelters, and the staggering number of animals all contribute to a veritable host of problems to surmount. One of the best ways to help shelters combat this issue is to raise public awareness, and spread information about the difficulties faced in providing such a valuable service. Running an animal shelter is difficult; you have to balance the desire to help as many animals as you can against the need to run profitably in order to keep your doors open. Compounding this issue is there is little federal or subsidized funding available for humane societies, meaning many of the non-profits have to make hard decisions in how many animals they can help, how much staff they can maintain, and how effective they can be. I’ve seen both photos and in real life, some truly beautiful animal shelters. Some of these had to have costs over a million dollars! Not very many animal shelters can do fund raising and/or acquire grants and donations to this extent. A highly affordable solution for animal shelters on a budget and in need of one or more structures is post frame building kit packages. For a fraction of the investment into an architecturally designed beauty, volunteer help can be mustered for a “barn” raising. Allocating fewer hard fought funds towards buildings allows more animals to be rescued and placed in deserving homes. Hansen Pole Buildings has a program which helps stretch the budgets of non-profit animal shelters. Any 501(c)(3) exempted organization qualifies for a 10% discount off from the everyday retail price of a Hansen Pole Building. For more reading on the Hansen Pole Buildings’ 501(c)(3) program please read: https://www.hansenpolebuildings.com/2013/08/charitable-organizations/. With experts to assist in design, complete and detailed engineer sealed blueprints, a step-by-step construction manual and a discount – this makes for a winning combination which saves not only money, but most importantly animals! This entry was posted in Pole Barn Design, Pole Barn Planning and tagged 501(c)(3) organization, post frame building kit package, non-profit animal shelter, humane society on March 20, 2018 by admin. In Underwood, MN, school district chairperson Frank Fee recently toured the district’s new bus garage (aka school bus barn) and noted, “You’d never know it’s a pole barn”. Indeed though it is, with internal parking for 14 buses, it is heated, has an office and a wash bay. As far as facilities go, new bus garages are often among school district’s biggest needs. The challenge being school district voters often vote against funding as they feel the proposed building plans are too expensive. The costs of not having an appropriate bus garage will most usually be more than the cost of the structure. Buses deteriorate from weather and vandalism when stored in outdoor or unsecured areas. The lifespan of a regularly used route school bus varies from 10 to 16 years, depending upon weather and miles, with 20 years seemingly being on the extreme high end. With the price tag of a new bus being approximately $110,000 being able to squeeze an extra year or two of service out of each bus can result in some significant savings. Overnight, the more valuable or regularly in-service buses will usually be stored in the interior of the garage, with less used or older service vehicles, and vehicles withdrawn for storage or awaiting disposal, stored externally. Often bus garages will feature staff canteen/break rooms and rest rooms for drivers assigned to ‘as required’ duties, whereby they may be required to drive relief or replacement buses in the event of breakdown. 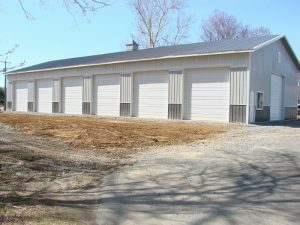 Post frame bus barns give an affordable solution to school districts on a budget. They are usually far less expensive than architecturally designed buildings. Architects are not cheap and an architect who does not understand post frame construction won’t design a building as optimally or cost effective as a company which specializes in post frame building kit packages. 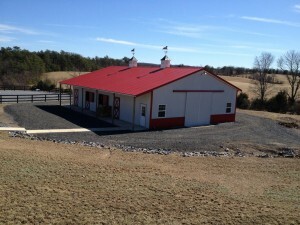 While steel covered post frame buildings are the most durable and affordable, any material can be used for exterior finishes and roofing – keeping any review committees smiling. 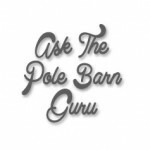 This entry was posted in Pole Barn Design, Pole Building Comparisons, Pole Barn Planning, Commercial Buildings and tagged pole barn, school bis pole building, bus garages, post frame building kit package on February 23, 2018 by admin.